Trying to set the background image (drawable) of a View programatically I ran into this ‘complex‘ error. view is a View type variable. AppTheme is the name of the theme defined in the attrs.xml file. The important thing to note here is the use of Resource.Stylable. I can’t directly reference the Drawable image because there are about 5 versions of the same image across the drawable-hdpi, drawable-ldpi etc folders. There is ONE entry in the attrs.xml file for each of the images (i.e. not one for each size), they are part of the theme. So it seems to access the ‘correct’ resourceId of the Drawable, you have to first load up the theme ‘TypedArray’ and do a GetDrawable against that. What Caused the ‘Complex’ error? // Exception of type ‘Android.Content.Res.Resources+NotFoundException’ was thrown. Two – I thought that since Resource.Styleable.AppTheme_someImage was a valid resource to use, that I could make a call to SetBackgroundResource and directly use that resourceId. Can’t find it. Even though as you can see the resourceId is exactly the same as what works. So it seems you DO need to create the Drawable first…then call SetBackgroundDrawable. Not sure if that is a Xamarin limitation…seems to be, otherwise why does SetBackgroundResource exist? First of all I have to agree with the article, quality developers have quality jobs and salaries that you as a startup cannot come close to. Those of us who are attracted to the romance of the startup usually have a stack of our own ideas that we never get enough time to work on…so your idea would have to be mind blowing to drop those ideas and pursue yours. Your idea is probably not that good. So the advice is to “learn to code, it’s not that hard”. Completely agree. Learning to code is easy…becoming good at it is hard. One of my fellow founders on the Founder Institute course had zero technical knowledge yet on the weekend he taught himself how to write and put up the landing page for his site! OK so it won’t win any awards but it is still a champion effort given his starting point and it’s the kind of, “screw you guys, I’m going to build it myself” kind of attitude that will make him a successful founder in the end. If he can do it…you can do it! You don’t need to be a good coder, that will take you years (I’ve been coding for 12 years and still feel like there is so much to learn), you just need to be able to sticky tape together a rough and kinda working prototype, get your MVP up and running and validate your idea. Balsamiq looks like a good tool, like Sketchflow the sketch like interface allows you to focus on how the thing will work rather getting caught up on UI specifics…UI specifics are important but not in the early stages and they can be seriously time consuming. As a founder of a tech start up you cannot have too much technical knowledge. I know of a couple of start ups where the leaders lack of technical knowledge is definitely damaging their product and more importantly, team morale. And it is not just about knowing how to code…it’s about have at least some understanding of the software development process. Keep in mind software is never finished, never bug free and never perfect. Oh and there is never enough time or budget to build all the features you want with the quality you need, be aware of the Iron Triangle. Where to learn? Pluralsight. High quality training videos, 10 hours free, then cheap monthly plans. I haven’t watched them but there are some ‘getting started’ type videos there. Many of the courses are geared towards Microsoft developer tools but there are iOS and Android courses as well. Where to get the tools? BizSpark. All the tools (and more) you need for free for 3 years! I primarily use MS tools, so best resources outside of that I’m not the guy to ask. The MS tools are awesome. So without a technical co-founder it is likely you will outsource development of some or all of your product. When you outsource development you are putting a large part of your future success in the hands of those developers and you do not have the necessary skills to know if the code that is being written is good or terrible. If you are spending thousands to get your product developed I would recommend paying someone you trust or a consultancy to do a code review, fairly early on. Just to make sure the code is of a reasonable standard. I have outsourced some of my development work to someone I have worked with in the past. He was an awesome developer and has started his own web development company, Cyberplex Software. He doesn’t write the code himself, he outsources it but he has done the hard work to find and put together a team of quality developers and designers. I’d recommend at least getting a quote from them, the work I have asked them to do was well priced and they’re easy and professional to work with….and no I do not get any kind of kick back for promoting them, it is simply a service I honestly recommend and am using myself (because I simply don’t have time to build everything myself). In 2010, there were 8 new posts, growing the total archive of this blog to 32 posts. There were 19 pictures uploaded, taking up a total of 483kb. That’s about 2 pictures per month. The busiest day of the year was February 5th with 153 views. The most popular post that day was Software Project Failure. The top referring sites in 2010 were stackoverflow.com, blog.ysatech.com, smartclient.codeplex.com, forums.silverlight.net, and social.msdn.microsoft.com. Some visitors came searching, mostly for wcf concurrencymode. 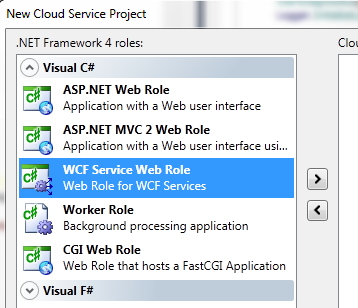 Recently I’ve been trying to get my WCF services working in Azure, this post shares some lessons learned. Some of these lessons will likely be obvious for those of you familiar with hosting WCF services in IIS, however I personally haven’t written web sites for about 5 years so even if my memory served me well (which often it doesn’t) things have changed somewhat. WorkerRole – Choose this if you want to spin up your own ServiceHost instances. Before trying to make my services work in Azure I was hosting them in a simple Console app and was therefore creating my own ServiceHost instances. So at first I tried getting my existing code working in a WorkerRole. I could make it work in the local devfabric but I couldn’t make it work in the cloud, the worker role seemed to start ok but the endpoints were not being exposed publicly, or maybe they failed to be created? I’m still not sure why because I changed tactics and changed my services run in IIS. The main reason for this is I figure running the services in IIS will be more robust and will provide better reporting. My service implementation code was in it’s own separate project, the service contracts were in another project as well. All WCF in Azure examples I found had the service, the contract and .svc in the WebRole. I wanted to keep my existing structure and it turned out to be very easy to do. All that was needed was to put some .svc files (one for each endpoint) into the WebRole project and voila, endpoints available in the devfabric and in the cloud. Contents of the .svc files…. Note that the .svc files must be in the root directory of the WebRole project as Azure does not have a concept of Virtual Directories. I still need to more play time to understand how this works more clearly. 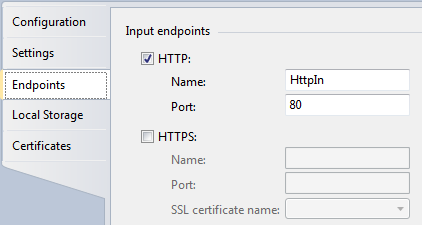 However what I did find is that if when I changed the port from 80 to 81 my endpoints were no longer visible in the cloud (they were visible in the devfabric). I’d say this is an invaluable resource, lots of useful Azure info for developers…. This is another thing that turned out to be quite simple. To make any WCF service available to an SL client you must have a crossdomain.xml file. Normally you need to put this file in the IIS root directory, the way to do this for Azure is to simply drop the file into the root directory of the WebRole project. Easy! Though I’d suggest host the services in ‘non-azure’ IIS and get it all working before switching to Azure. The crossdomain.xml thingy can be tricky, I’ve posted about wrestling with crossdomain.xml before. My web services were using an IoC container for various things and so the constructor of each service took a container. For an IIS hosted service you need to have a parameterless constructor so I had to make some semantic changes to the code to allow for this.